Today's dental technology allows us to offer our patients the best precision and accuracy available for diagnosis and treatment for replacing missing teeth. 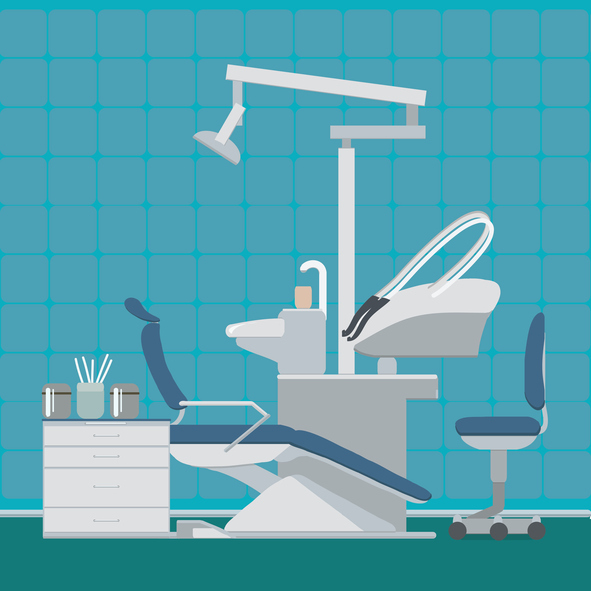 At Dental Implant Center at Walnut Creek, we offer a unique experience that will seamlessly blend both professional care with the most updated technology. We work with a precision of artistry to restore your dental comfort and function, both authentically and affordably. Our team, including Dr. Keith and Dr. Gibbs, believe in staying abreast of the latest techniques and technology for the benefit of their patients. As prosthodontists, their specific training is in the design, manufacturing, and fitting of artificial dental replacements, including the tooth root implant system and adjoining dental crown. Your appointment begins with an initial evaluation and consultation. Planning your procedure is the portion that will lead to success. Using precise technology, we eliminate any space for error. The plan beings with digital impressions. At our office we use the Iluma Cone Beam CT (CBCT) Scanner with an integrated Ilumavision 3D visualization software. Our 3D Imaging system takes CT Scans, which is a collaboration of multiple x-ray images that have been combined with the aid of a computer to generate cross-sectional views giving a three-dimensional image of the jawbone. This allow us to refine our diagnoses, identify vital nerve structures, and measure the bone quality and quantity available for implant placement. 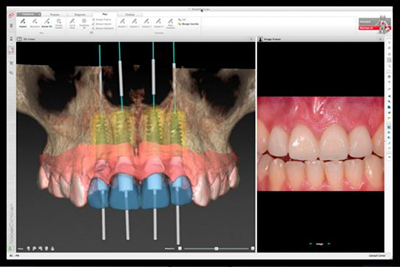 This system allows us to take digital cross-section images of your jawbone which will help us refine our diagnoses, identify the patient's vital nerve structures, and measure the bone quality and quantity available for implant placement. In some cases, we may be able to reroute implantation to avoid the additional step of bone grafting. These images assist in setting us precise placement, a benefit for both the dentist and the patient. • Safety: The patient's safety is our highest concern. The surgical guide rests on the teeth, gingiva and bone. By using our system, there are stops that limit the depth of the drill and limit the depth of the implant. All guesswork is eliminated. • Predictability: Guided surgery allows us to take the guesswork out of the predictability of the success of the implant. We are able to accurately predict the outcome of the patient's implant treatment with CBCT scans displaying virtual implants and teeth. We can virtually determine the results of their oral and medical expectations. • Efficiency: Patients love how efficient Guided Surgery is. Once the plan and model is in place, the actual procedure of placing your dental implant is completed in less than 20 minutes in our office for single teeth. A full arch of implants take less than an hour. You can come in with no healthy teeth and leave with a mouth full of them. 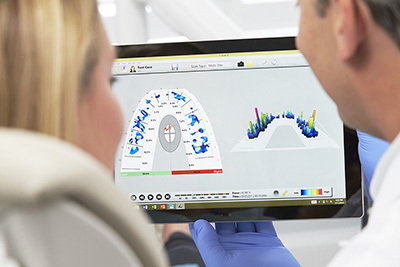 Made by Tekscan®, the hand-held T-Scan device is used as a digital occlusal analysis system to measure a patient's bite force. The T-Scan is a sensor placed into a patient's mouth which they bite down upon to record a digital impression of tension placed on the teeth. The software allows Dr. Keith or Dr. Gibbs to adjust the size and shape of the teeth customized for an individual patient, thus giving greater accuracy. Measuring bite force is important to determine how much pressure is placed upon replacement teeth, such as implants, so that adjustments can be made to avoid fracturing the ceramic, loosening the implant screw, or harming the gum and bone tissue. The recording is shown in real-time on a screen, delivering fast results and better communication with the patient to understand the examination. Seeing exactly where the points of tension on the teeth lie helps patients understand the need for a new crown, rooth replacement, or other procedure. Our goal at Dental Implant Center at Walnut Creek is not only to provide each patient with quality prosthodontic restorations, but also to educate individuals on the cause and effect of their treatments. Modern radiography is now conducted with digital x-rays, which our office utilizes. Digital x-rays, unlike traditional film x-rays, require much less radiation to process - about 80% less. Without as much radiation exposure for patients, x-rays have become safer. Digital x-rays can be viewed soon after the images are taken and do not require processing time as traditional film does. Dr. Keith and Dr. Gibbs can promptly and clearly share digital images on screen, allowing patients a better understanding of the state of their oral health. 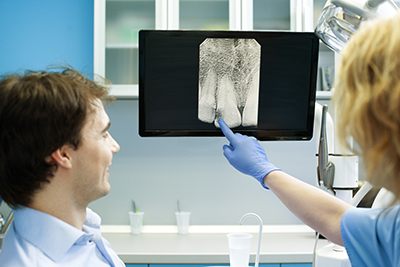 Without the need for chemical processing, digital x-rays are also much greener than film. The ability to send digital x-rays electronically also expedites forwarding patients' medical records, saving time in obtaining images and providing a diagnosis. Dental Implant Center at Walnut Creek serves patients in the East Bay Area. Our doctors are board-certified prosthodontists, one of the nine dental specialties recognized by the American Dental Association. This certification come from extended years of schooling and time in clinic, specializing in creating and placing dental prosthetics. Our goal is to do everything once and do it well! We are here to answer your questions. Contact our front office at (925) 266-3550 today.